In anticipation of the new James Bond movie SKYFALL, the Land Rover 110 Defender makes its debut in prestigious Harrods window display in London. Land Rover’s 110 Defender Double Cab pickup that stars in the new James Bond movie SKYFALL, made its debut in London in prestigious Harrods, Brompton Road, Knightsbridge. The Defender is the same Land Rover driven in the opening scene by field agent Eve (played by Naomie Harris). The new James Bond Movie will also feature a 2013 Range Rover and Jaguar XJ which were also used on-screen and as production support vehicles in the new movie. John Edwards, Land Rover Global Brand Director said; "We are thrilled to be part of the Harrods windows celebrating the release of SKYFALL and the 50th Anniversary of the franchise. In displaying the Land Rover Defender that was actually used on screen we hope to bring a taste of behind the scenes action to our first ever James Bond Harrods window." The Land Rover Defender is recognized around the globe for its rugged go-anywhere design and was the perfect vehicle for the new James Bond movie SKYFALL. Co-Producer Andrew Noakes, a veteran of 11 James Bond films, said: "Bond is quintessentially British and Jaguar and Land Rover are two of the most established and globally recognized British brands, so it was a natural step for us to involve them in the film." He was speaking at Pinewood Studios, where the Land Rover 110 Defender was filmed in the opening scene. The new Land Rover Defender received a number of substantial improvements last year, including introduction of the 0EU5 2.2-liter diesel engine. The smaller 2.2-liter diesel replaced the 2.4-liter diesel in 2012 matching it for power, torque and fuel consumption. The Defender also received new ventilated disc brakes, detail improvements to the interior and new option packs to the 'S' and 'SE' trim levels. The new 2.2-liter diesel is mated to a GFT MT 82 six-speed gearbox with a high top gear. 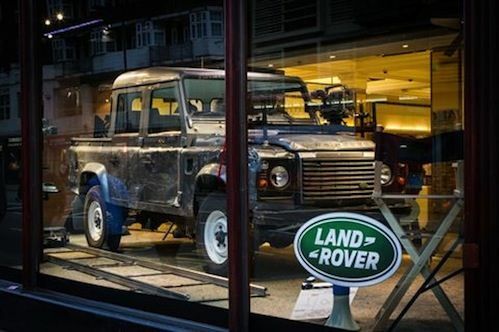 The Defender must have gone through an exciting opening scene, because it shows some extreme wear and tear as it sits on display in the window of Harrods. The vehicle is the prefect machine for the James Bond scene with its high top end and low-speed crawling capability for off-road escapes. The Land Rover Defender makes its appearance in the 23rd Bond film SKYFALL here in the U.S. November 9, 2012. It will remain on display at Harrods, Brompton Road, Knightsbridge until Saturday October 27th, 2012. Watch the SKYFALL Land Rover Defender featured in Harrods window display.